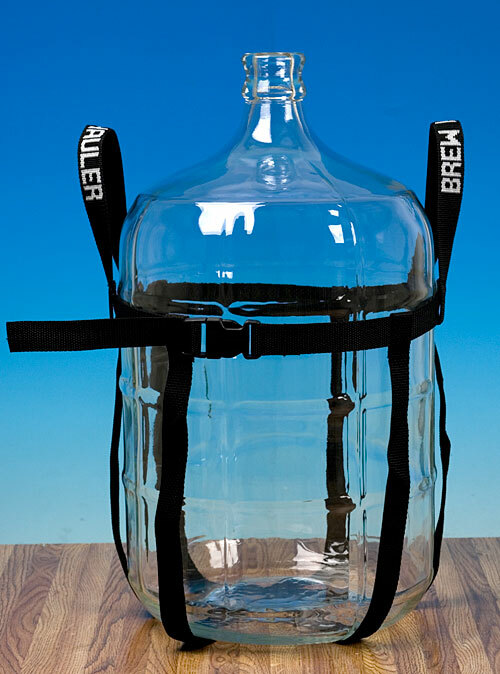 This nylon strap holder fits 5 to 6½ carboys, and is the safest way to lift a heavy glass carboy, particularly if wet or full. The nylon strap has a quick release that cinches tightly around the carboy. Handy when lifting full carboys out of upright chest freezers. Made in U.S.A. I wasnt to keen on the old brewhauler clasp design. It felt as if it may fail one day so I stopped using it. the new design is a standard 3 prong pressure clip, much safer imo. Thes are a must have if you are tall, save your back and get a brewhauler! I own a couple of these things - I use them on all active fermentors 100% of the time. Dropping a PET carboy could make a big mess, dropping a glass one could be a visit to the hospital while your S.O. cleans up the mess. The Brew Hauler is a simple, but high quality, device that gives me the confidence to move my fermenting brews around safely. One example:  I cold-crash in my keezer which means lifting a carboy up relatively high and placing it down gently on the floor of the keezer (not to mention lifting it out of there to keg). One note:  The design on these may have changed over the past few months. This latest Brew Hauler from Williams Brewing has a metal hasp on it, my other/older one uses a plastic one. They were the same price - I just think Williams has the better product! from Versaille, KY This is NOT DUMMY PROOF! I was carrying 5.5 gallons of wort in my kitchen, when the glass carboy slipped between the straps of the harness and exploded on the floor. I admit to some operator error for not paying attention to how the straps were spread out beneath the carboy, but I would not have believed it would allow the carboy to slip through the sides like it did. I've since sewed on another two straps around the harness, closer to the bottom. So a carboy cannot slip through the strapping. Decent product, but not, unfortunately,  dummy proof. My suggestion to Brew Hauler is to add a second strap to make it more of a nest. After breaking a full 5 gallon glass carboy, I've been looking for a way to move and lift my beer and wine without having to ask my wife for help. I made an 18 X 18 movable platform with casters for each carboy, and attached a Brewhauler for lifting to a siphoning position. It's definitely the safest way to handle the job. It's easily removed for cleaning the empty carboy. Will this work with the 6 Gallon Fermonster? Yes, the Brewhauler does fit the 6 Gallon Fermonster.